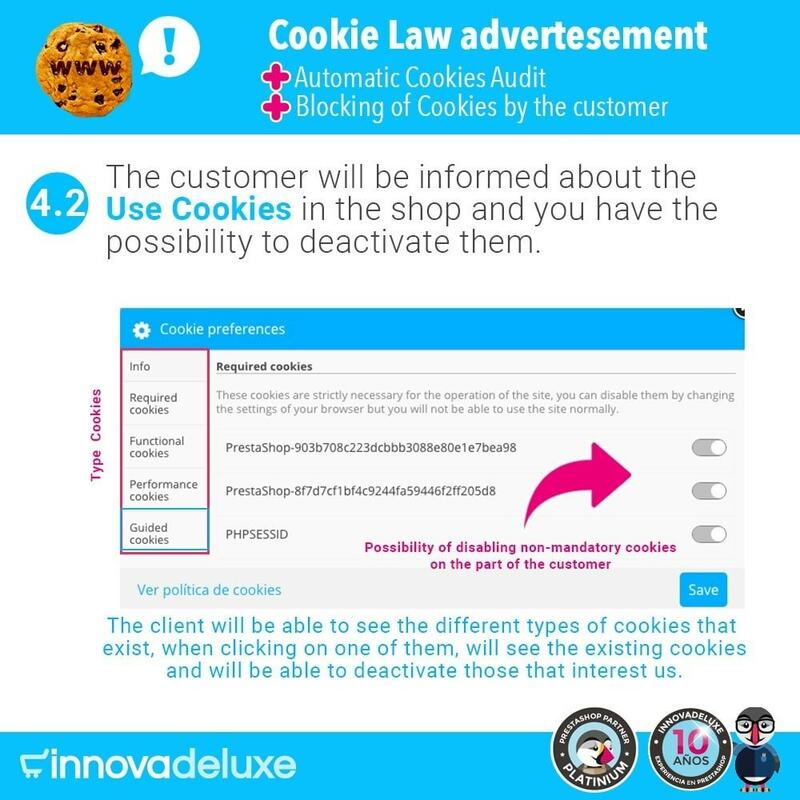 We will help your customers to accept cookies policy of your store to obey with the law on data collection. 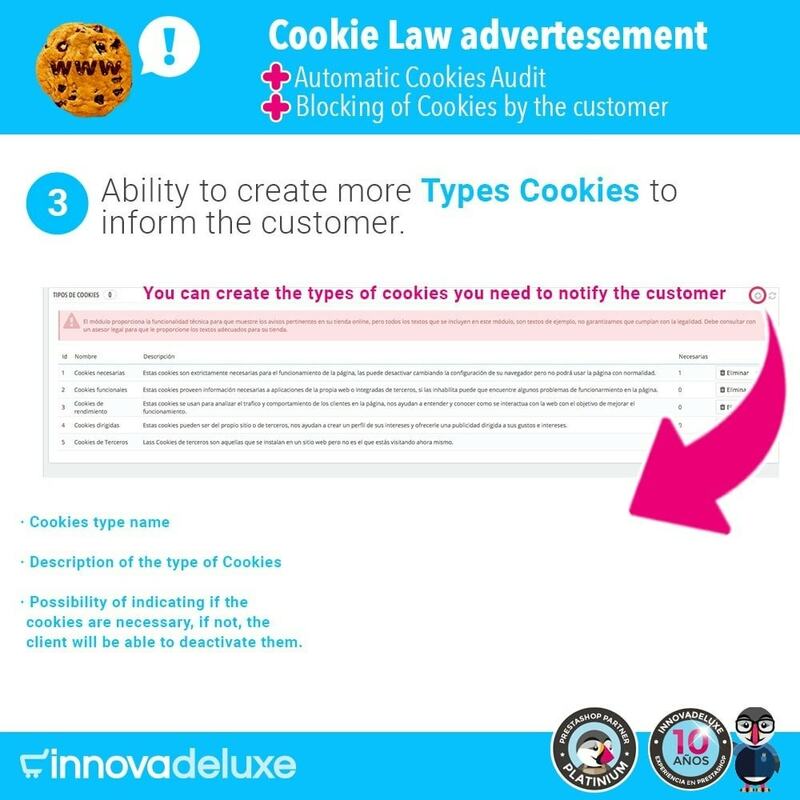 This module runs in your online store when your cookies legal texts, are clearly specifying what type of cookies are you using and what is the data collecting destination. 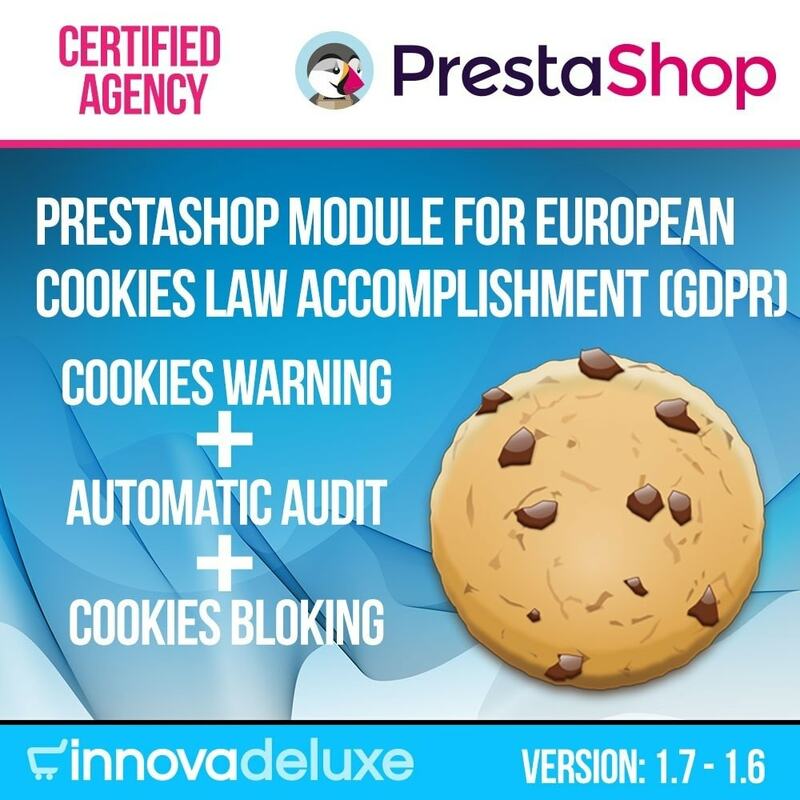 To determine the type of cookies you are using, please ask an expert to check your Prestashop store. To learn how to prepare the legal text you need to include in your store, you can ask a GDPR and LSSI experienced adviser or check this guide provided by the Official Data Protection Agency. 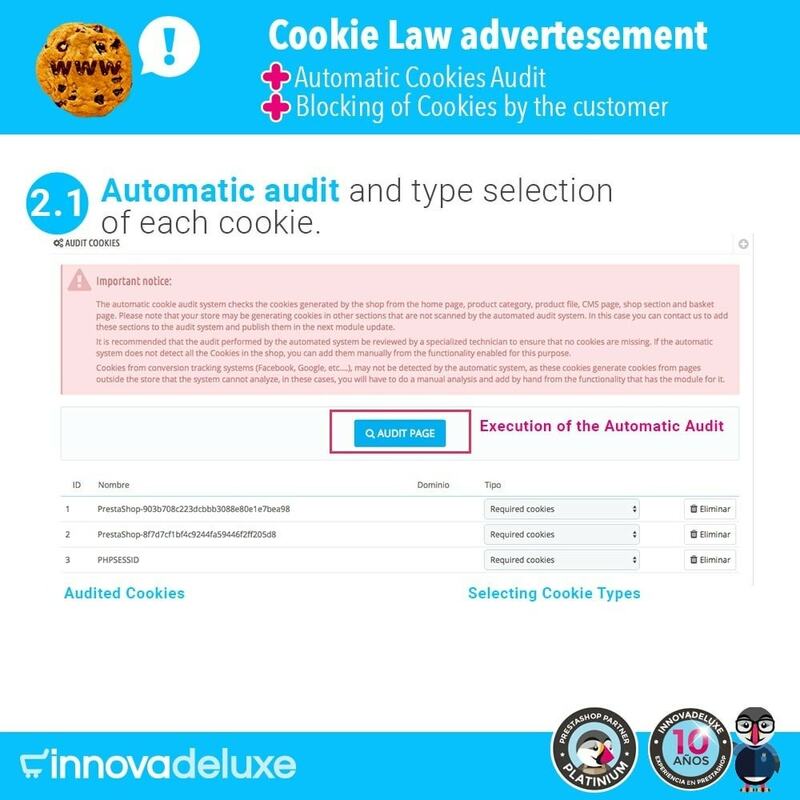 The module includes a powerful auditing system, to check which cookies are generating internally the modules you have installed. 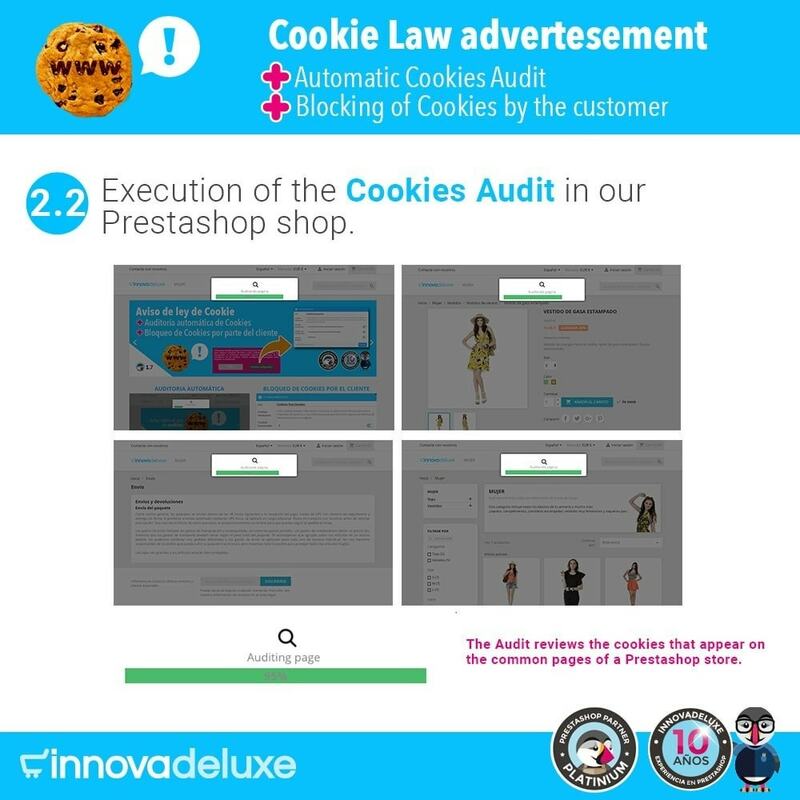 The module will review each section of the front office of your store and will list all the cookies detected, which you can categorize to show the information of each one in the cookie advice. At this time, you cannot audit cookies from external domains, but you can add them manually. You can use any extension for your browser and then add them manually to the module. 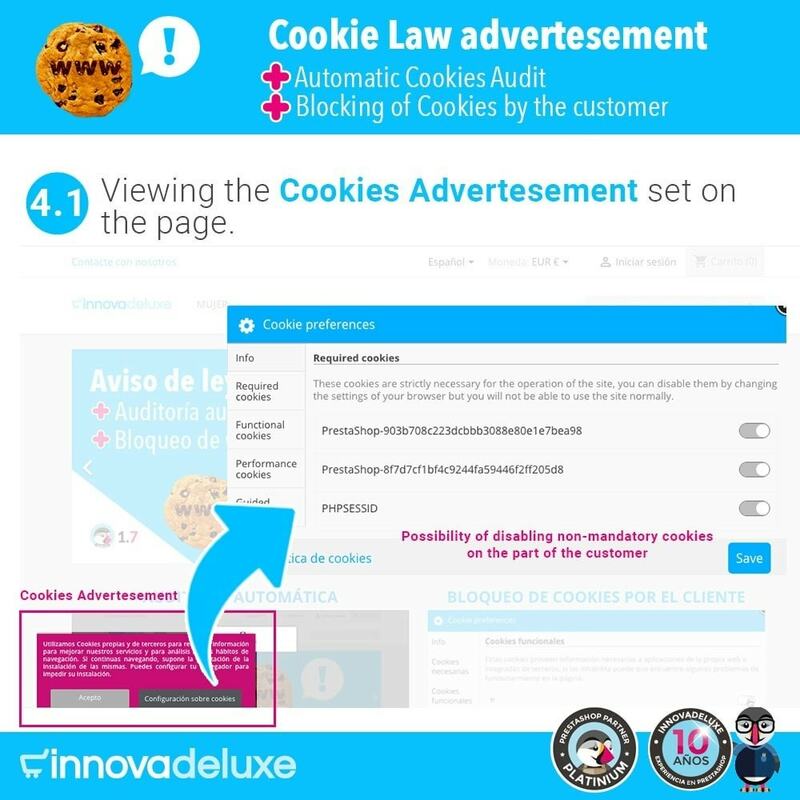 A new and much more powerful cookie warning has been created, in which you can display the information of the cookies distributed by the type of cookies. For example separated by Essential Cookies, Performance Cookies, Analytical Cookies, Third Party Cookies, etc... With information specific to each type of cookie and each cookie. The visitor can configure the cookies that your store uses on his browser to suit his or her needs, and can block cookies that do not interest him or her, such as those from third parties or analytics. Cookies that are essential for the proper functioning of the shop cannot be deactivated. You will be able to decide which cookies are essential. Change the background color of the message and adapt it to your template. Change the color of the notification text. Display a personalized messege for warnings. The module will link your configured legal text. Set the position of the notification (various positions available). Set the text of the link button to the Cookies policy. 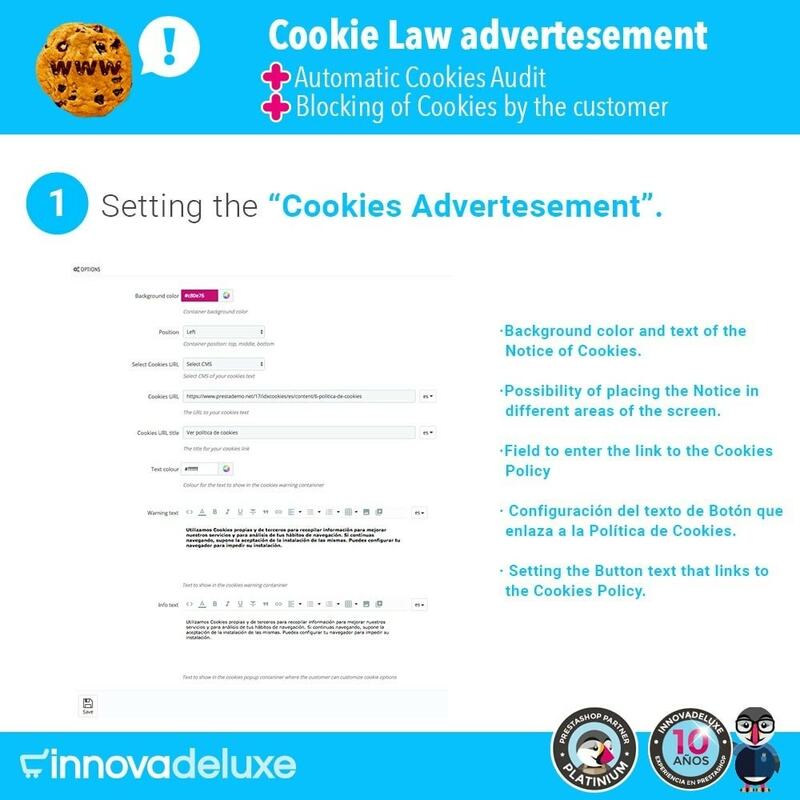 Allows you to set a different legal text for each type (category) of cookies. Allows you to create new types (categories) of Cookies. Allows you to indicate which are the essential Cookies that the visitor will not be able to deactivate. Allows you to assign each cookie to a particular type (category) of cookie. It allows you to audit your store to see what cookies it is generating. Allows the customer to block cookies. If you need to audit any other page, such as one created with some unofficial module of Prestashop, contact us so that we can make it compatible in future updates.